Spend any time at all in Greece, go visit your friendly neighbourhood Greek taverna, watch “My Big Fat Greek Wedding”. Chances are you’ll come across this slightly esoteric name that slitheringly rolls off the tongue and somehow conjures up an image of something rustic and homely and yet exotic and mysterious. Its kind of like gourmet sounding comfort food, and during my travels in Greece, I came across many examples of the vegetarianised option of the Moussaka that kept me from starving on many an occasion. Given its ubiquity and omnipresence, I thought I’d find out a little more about how this particular culinary treat came about. Simple, right ? Find a Grecian, and ask and then sit back and listen to how this wonderful dish has been around since the beginning of time ? Nope, no luck. Turns out most Greeks know even less about the antecedents of this very “Greek” dish than you and I. So I started looking deeper. And like those pesky illegitimate and undeserving relations who come crawling out of the woodwork to contest last wills and testaments of persons of some material stature, I was confronted with a whole phalanx of me toos and wannabes. 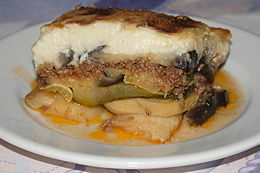 There is the Turkish “Musakka”, the Bosnian “Mousaka”, a Bulgarian cousin twice removed and a Cypriot version by marriage. Screaming loudest of all is the Egyptian “Musaqa’h”, meaning moistened or chilled and thereby claiming paternity beyond all doubt. So how did the Greeks win this one ? Especially given that etymologically, the Greek word “mousakas” does derive from the Arabic root ? Take a bow Nikolaos Tselementes. Who’s he? Only the most celebrated Greek chef ever – think Julia Childs tossing plates and shouting “Ommpah” ever so often. This highly venerated doyen of Greek cuisine is said to have been the vanguard in contemporising Greek culinary exploits. If you wish to complement any one who has cooked a Greek meal for you, call them a “Tselementes” and see what happens. Lots of raki on the house, I assure you. Chef Tselementes, me thinks though, had a very confusing idea. He believed that traditional Greek cuisine (which presumably had been around, well ever since Greece was around, give or take a 1000 years) had moved away from its natural European roots and hence needed to be aligned with Continental cookery in order to be more authentic. See how that can be confusing? Anyways, confusion be damned, he set about reinventing and reinterpreting the basics in order to achieve this sublime transformation. And on one red letter day circa 1920, he purportedly came up with the idea of a 3 layered main course dish consisting of roasted aubergines, minced meat, topped with béchamel sauce and baked. All the elves in the kitchen snapped to and did his bidding, and lo and behold – a culinary legend was born. And has subsequently been bastardised again and again. It’s a pretty flexible dish, so keep the basic concept the same, tweek the ingredients a wee bit and you have some interesting derivations. Add a layer of fried potatoes for that starchy gratification. Let some sautéed zucchini hold a smoky conversation with the eggplant, or let some earthy mushrooms make a special appearance. Whisk some yoghurt into the béchamel for a tangy aftertwist. Or go vegan with “pseudo moussaka” with the meat and dairy replaced by a brawl of veggies and tofu in a riotous tomato ragu. Mutants all, but if the proof of the pudding is in the eating, then go ahead and lick the platter clean. Mixed metaphors aside, the large and ever growing family of moussakas are a searing reminder of the fact that not everything “traditional” comes from centuries of tradition. Sometimes, all it takes to become a traditional favourite is for something to taste good. Period. Tselementes’ book, Greek Cookery, can be found here.